For me, that basically translates to every time I pass by a Girl Scout, I begin salivating for Thin Mints, a la Pavlov’s dog. I’ve said it before, and I’ll say it again, I love the combination of chocolate and mint together! As a kid, my dad would buy a few boxes of Girl Scout cookies to support a co-worker’s kid, and I’d demolish the Thin Mints before anyone else had a chance to get their hands on them. Shall we take a gander at exactly what I was consuming? 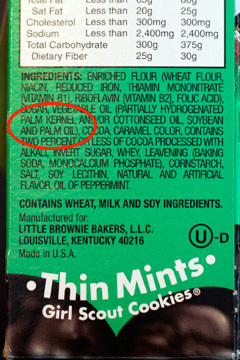 Hydrogenated oils, invert sugar, ‘natural’ and artificial flavors, not to mention wheat, soy, and dairy. Not exactly a healthy treat. Ever since I posted my Chickpea Flour Chocolate Chip Cookies, I’ve been getting such great feedback from you all about them, so I’ve wanted to employ the versatile flour in other recipes. I’ve been working on a cracker recipe for my oldest daughter using the bean-based ingredient, and in considering the great ‘crisp’ it adds to that recipe, I thought it would work awesome as a Thin Mint. When I search various recipes, I have recently found myself avoiding, yes AVOIDING, recipes that are deemed ‘gluten-free’ or even ‘grain-free’, primarily because it either means the recipe contains a lot of starch, gums, or nuts (AKA almond flour/meal), none of which I tolerate well. Chickpea flour is so awesome because it’s high in protein, it doesn’t need eggs to bind it together, and it’s able to be used on its own in recipes, without having to combine ten other flours with it. The one thing to remember when working with it is DON’T TASTE THE BATTER! As I suspected, the flour lends a crispy texture to these cookies that’s unique to traditional Thin Mints, making the recipe that much more legitimate. The mint flavor is pretty spot-on, if I do say so myself, and the chocolat-y coating sets the whole cookie off perfectly so that you WON’T feel like you’re missing out on anything! Mix together the dry ingredients for the cookies: flour, cocoa, salt, and baking soda. Mix together the wet ingredients for the cookies: maple syrup, oil, and mint. Mix together the ingredients for the cookies until well combined. Using wet/damp hands (so the dough doesn't stick), make about 16 small, round Thin Mint-sized discs (the dough should be about 1/8 inch in thickness). Place the cookies onto a parchment paper-lined cookie sheet. Bake the cookies for 11-14 minutes, until tops appear baked. Immediately out of the oven, press down on each cookie with a fork to further flatten the tops and eliminate the small amount of air present (this contributes to making the cookie crispy). Place the cookies in the freezer while you prepare the chocolate coating (or for about 10 minutes until cool to the touch). Whisk together the ingredients for the chocolate coating until smooth. Once cooled, dip each cookie into the coating, covering it completely. Place the cookies onto a large wax paper-lined plate and into the freezer to harden. Enjoy once the chocolate coating has solidified, but keep in the freezer for best storage (especially if using coconut oil in the coating, as this melts quickly). With less than six grams of sugar and nearly three grams of protein per cookie, what’s not to like? Gonna try these with almond flour. We’re Keto here. Thank you for the recipe! Can honey be subbed for the maple syrup? I know it would not be vegan anymore. Omg, these look out of this world delicious! I can’t wait to try making them.. I just found your blog and am enjoying reading your creative and natural recipes. Thank you. Is there a sub for chick pea flour? Can you make chick pea flour? I’m not sure on either question, as I made these to be specific for chickpea flour, sorry! You can order chickpea flour on sites like Amazon or Vitacost. These are so awesome I’m sending my readers to you for the recipe! I know I’ve said this already but you are so creative, inventive, and innovative. Really, you never fail to amaze me. This is such a great way to use chickpea flour, I’ve never seen something quite like this! What a cool idea! I never would have thought about using chickpea flour in something like this. Thanks for the recipe!! use doTerra essential oil…peppermint!! Cant wait to try! Hi! Love your blog! This recipe looks great (I make your chickpea chocolate chip cookie recipe all the time!). Quick question though, can I sub raw cacao powder for the cocoa? I LOVED LOVED LOVED thin mints. I am so going to try these! Do you think peppermint essential oil would work instead of mint extract? I think it would, but you’d probably have to taste as you go, since I don’t know the equivalent measurement. These look so awesome! I love chickpea flour – it’s crisps up so well when baked!! I make the mistake of tasting the batter every time and always regret it haha! OH MY GOODNESS! i am soooo going to make these!!! Question: should my flour be cold on this one or no? AND what kind of mint extract do you use? i need to buy some. THANKS!!! Lol, the flour is room temperature for this one. 😉 I usually buy a peppermint extract by McCormick spices, which you can pretty much get anywhere. 🙂 Let me know how they turn out for you if you make them! OH, i’ll be making them! thanks Lauren!